During the months of November-April Maui sees an increased number of visitors to the island, including the Humpback Whales. These magnificent creatures travel all the way from Alaska to give birth and find new mates. One of the biggest threats these whales face upon arrival isn’t deep water predators or lack of food (although they will lose a significant amount of body weight while here) but the potential for being entangled in rogue fishing line, rope, and other debris. 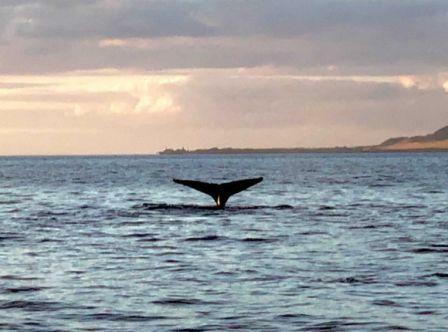 At the beginning of March 2019, the U.S. Coast Guard Station Maui assisted the National Oceanic and Atmospheric Administration in disentangling a humpback whale off Makena Beach in South Maui from 200 feet of heavy gauge line. Just a few weeks earlier, a team of trained responders authorized under NOAA’s Marine Health and Stranding Response Program launched a two day effort to free an adult Humpback entangled in debris and buoys. Despite efforts in some places to retrieve lost nets, debris, fishing line and other entanglers, the truth is, ocean currents travel. In places where debris is left out to sea it could potentially end up here in Hawaii, where 60% of the estimated 23,000 Humpback Whales in the North Pacific also find their way. We want you to get involved. If you’re planning on visiting Maui, please consider stopping by the Hawaiian Islands Humpback Whale National Marine Sanctuary where you can learn about the plight of these gentle giants. They provide free whale talks every Tuesday and Thursday at 11am and what you’ll probably take away is the fact that we truly know so little about these creatures. Why do whales sing? -There are theories but we’ve still not put a definitive answer to it. How long does it take for mothers to give birth? -There has never actually been a live birth recorded, so there’s still so much to understand. Take a whale watching tour if you can. Seeing a mama Humpback and her new baby surface together in unison will make you weep. Honestly. It’s incredible. Here in Hawaii, we’ll maintain our efforts to clean up the ocean and we’ll encourage others to do the same. As we’re realizing, the balance of the planet can be so quickly put off. We will continue to keep our Aina (land) and Kai (sea) as healthy as possible and we ask you to join us here, in the most geographically isolated place on earth. Share in the appreciation for the land and the sea and experience the love we all have for these amazing, curious and majestic Humpback Whales.